Planet Earth Shirt. White edition. A masterpiece of engineering that you can wear anywhere on Earth. 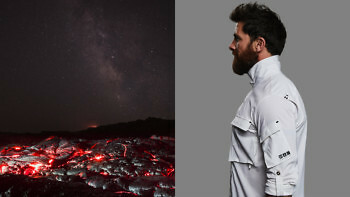 There are over 510 million square kilometres on the surface of Earth, and this shirt is designed to work in every single one of them – with a reinforced anti-mosquito collar for the jungle, 7 concealed air vents that work like in-built air-con for the desert, a hidden passport pocket for hostile environments, 9 gadget loops for the mountains, over 62 metres of stitching reinforced with welding, and shatterproof buttons made from the world’s toughest nuts. Water repellent, dirt repellent, bacteria resistant and fast drying, it’s built from advanced high-performance Swiss and Italian materials that stretch and breathe like sports gear. Whether you’re in a mangrove swamp or the office, you’ll find this is the most technical shirt ever built. Sign up to get advance access to the next edition of the Planet Earth Shirt and other new releases. We shot the Planet Earth Shirt: White edition on adventurer and explorer Aldo Kane who is 5ft 9 / 175cm and wearing size medium. The shirt fits true to size and if you’ve already got our Mountain Shirt you’ll find this has a similar fit. For more advice on sizing, check our size guide or ask us for help with sizing. And don’t worry if you order something and it doesn’t fit – we have a free, no hassle 30 day return and exchange period. Designing and building a shirt that can truly thrive in any terrain on earth has to be an exercise in no expense spared craftsmanship. With materials starting their journey in the most cutting edge fabric mills in Switzerland and Italy, and with buttons starting their life inside a fruit, each shirt is then assembled in one of the most advanced factories in the world, in Portugal. Hundreds of separate construction processes, over 35,000 stitches, and more man hours than almost anything else in your wardrobe go into making this shirt a technical masterpiece. Starting from the top, the collar can be worn in 4 different configurations. In jungle mode, you’ll want to use all the features of the collar – which means turned up high and fastened tight. It’s a reinforced double collar which means you can fold it right up to meet your hairline at the back and jawline at the front. This keeps the sun and mosquitos off the back of your neck, and helps stop any bugs getting down your shirt. You’ll find two strong, lightweight and quiet snap fasteners that secure the collar in place. It creates a completely different shape to a standard collar as it double fastens across your throat to keep mosquitos out. Both poppers are attached with reinforced stitching. We avoided Velcro as it’s too noisy and also unreliable in the most humid climates. We’ve used heavy duty zig zag stitching and reinforced material to strengthen the collar, so it will hold its shape even if drenched. Working down from the collar you’ll find a giant hidden air vent that runs almost the entire length of your spine. Designed for hot, humid, or arid environments it’s one of 7 concealed air vents in the shirt that work together like in-built air-con. Each vent opens and closes either with body movement or with zip closures. And we’ve built them in the places you’re likely to sweat most – down the centre of your spine, your armpits, down the centre of your chest, and around your waist. When you open up each vent you’ll find it’s lined internally with a feathersoft, lightweight Italian mesh fabric. The mesh is fast drying and incredibly breathable which means sweat can escape easily and air can flow into your shirt to cool you rapidly. The three vents at the back are engineered like joints, creating extra flex in the shirt down your spine and across your shoulders. The two front vents hidden either side of the chest pockets are zipped so you decide when to open them up to air. And there are two slit vents along the hem. Every vent is reinforced for strength. Either side of the concealed air vents on the chest you’ll find two deep pockets. They concertina out to fit a phone or GPS inside them, and have reinforced stitching so you won’t tear them if you’re rushing. Built directly behind the right chest pocket is an even larger hidden pocket designed to hold things you might want to conceal in a hostile environment. With a concealed zip entrance, it’s large enough to hold your passport, money, maps or documents without any danger of them falling out. Together the pockets are designed to make your shirt more like a utility belt, so the left chest pocket is a very different beast. Instead of a hidden passport pocket you’ll find a series of 8 stitched gadget loops made from a reinforced twill tape for attaching carabiners, compasses or any clip-on gear. Two tunnels on the front of the pocket will hold mini tools, pens or penknives, depending on your plans. On the bottom of the pocket is a reinforced hanging loop for tying off. Both chest pockets fasten with two hidden slip buttons concealed on a tough woven tape. The Planet Earth Shirt adapts to life in the city as easily as it thrives in the jungle. The collar can be worn turned down and unfastened just like a regular collar. The cuffs button up with two slip corozo buttons to look like regular cuffs. Both chest pockets will fit your phone. The hidden passport pocket holds your keys. And a fourth bellows pocket on the left arm will keep your credit cards to hand. The front air vents zip up. And when you’ve washed it, you’ll find two internal hanging loops with snap fastenings, so you can hang your shirt up to dry off anything from a jungle creeper to a washing line. To build a shirt that can work anywhere on earth you need to start with an exceptional material, so we built our fabric from scratch in Switzerland with cutting edge fabric mill Schoeller. By blending a robust, heavy-weight cotton with elastane, we created a material that will cool and calm your skin in intense humidity and stretch with you in any direction. The fabric is also Blue Sign approved which means it’s produced with minimal impact on people and the environment. Jungles, dirt, bacteria and salt water will all destroy your clothes, so we treated every square centimetre with Schoeller’s 3XDRY treatment. It turns the outside of the shirt into a water and dirt repellent shield. And it makes the inside of the shirt behave like a sponge – rapidly absorbing and spreading any sweat over a massive surface area so that it can evaporate at high speed to cool you. An antimicrobial treatment inhibits the growth of bacteria on the fabric to kill microorganisms that feed on heat, humidity and moisture. The fabric and construction of the shirt come into their own in cold terrain. It’s soft, stretchy and high-wicking enough to be worn as a baselayer and prevent the build up of sweat that can rapidly chill you. Or you can wear it over all your other layers as a field jacket as it’s engineered with 4-way stretch as well as multiple pockets and attachment points. The front air vents can be zipped up. And the same collar that was designed to keep the sun and insects off you will also help keep you warm when folded up and fastened to its full height. Even the way the shirt buttons up has been engineered to withstand freezing fingers, sweating hands and hostile vegetation. Rather than being sewn onto the shirt, the buttons on the front of the shirt have all been threaded onto a heavy duty woven polyester tape that runs the shirt’s entire length. The tape is then stitched onto reinforced panels above and below each button. The construction allows the shirt to flex incredibly and withstand any tearing forces, as each button is free to slide 2 centimetres up and down its section of military tape. All 17 buttons are attached in the same way. Every button on the shirt starts life as a corozo nut buried inside the spiky fruit of the Tagua Palm trees found on the coastal mountain ranges of South America. Corozo is phenomenally strong so can be carved with stunning precision. It’s highly resistant to scratches, extreme temperatures and impact, so won’t crack or splinter. Made from 100% organic fibre, each button has a unique grain just like a fingerprint, so no two will ever be the same. And all buttons are sculpted with a highly polished 30 degree taper towards the edges to make them extremely easy to slip into place. Stitching remains a phenomenally durable way to build clothes when it’s executed with patience and skill. Even if one stitch snags, in every shirt there are over 35,000 more to take the strain. Of course, as this is a Planet Earth Shirt, even our stitching is reinforced. Every seam is twin needle stitched, which means two lines of stitching instead of one to double the strength. And at every critical stress point you’ll find one of the shirt’s 19 matt black bartacks welded on to reduce the chance of failure. Once you roll up the shirt’s sleeves, they stay rolled. They’re engineered in the shape of a moving arm, and the material is weighty enough to hold its position. But if you’re moving seriously hard or fast, you can also button them in place. On the inside of each sleeve you’ll find a 20cm long reinforced strap that you can pull out, up and over the rolled sleeve and fasten to a small slip button on the outside of the arm that’s secured on its own reinforced patch and military tape. Each 20cm fabric strap has two buttonhole settings. 50,000BC Jacket waiting list. We'd have colonised Earth faster if we'd had this jacket. 100 Year Pants. Khaki edition. The only pants more advanced than these are on spacesuits. Relaxation Hoodie. Blackout edition. An isolation tank you can take anywhere. Solar Charged Jacket. Part running jacket. Part high tech toy. This is the most advanced jacket ever made. Mountain Shirt: Alpine Green edition. A shirt as timeless as the mountains.